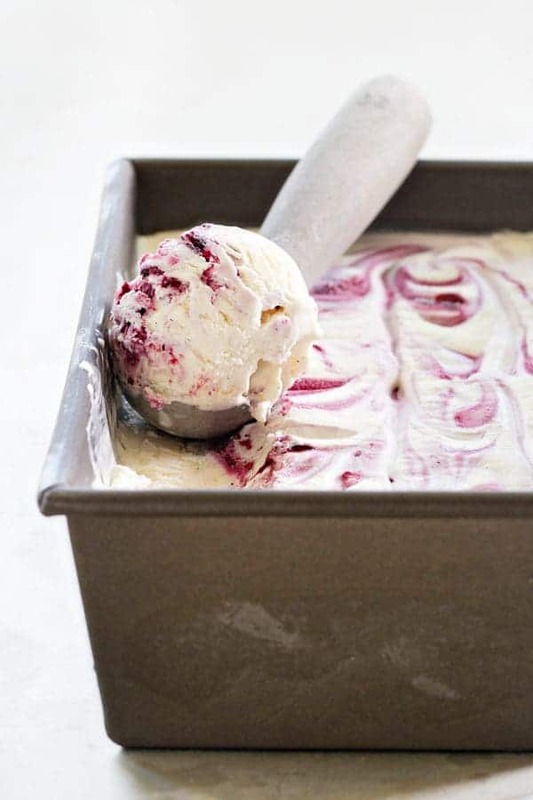 No-Churn Roasted Berry Ice Cream is full of sweet spring berry flavor. The little flecks of vanilla make it extra special. This is a sponsored post on behalf of Nielsen-Massey Vanillas. Thank you for continuing to support the brands that make My Baking Addiction possible. It’s finally starting to feel a little like summer here in Ohio. After weeks of cloudy skies and rain, the sun is starting to make an appearance on a regular basis and the temperatures are on the rise. We’re even beginning to see our freshly planted grass poke through the soil. If you’re a regular reader of My Baking Addiction, you might remember me complaining about issues that prevented us from landscaping our property last fall, forcing us to wait until this spring. It’s been a long, dreary, muddy time. This is officially the first summer with grass at our new home and I must say we’re all very excited – especially Elle. Because having grass means we can finally purchase a swing set and since swinging is one of here favorite things ever, she’s totally pumped. With warmer temperatures also comes my craving for sweet, plump berries. Whether we’re enjoying them with yogurt and granola, or tossing them in a bit of sugar to top cheesecake brownies, summer berries are one of our favorite things about the season. Another one of our favorite things about summer is ice cream. And even though we have 2 ice cream makers, we’re big fans of no-churn style ice cream. If you’ve never made no-churn ice cream, it’s something you have to try. With only two base ingredients and minimal effort, you can create a deliciously creamy, dreamy ice cream without any special equipment. From No-Churn Mudslide Ice Cream to No-Churn S’mores Ice Cream, we’re all about No-Churn recipes all summer long. 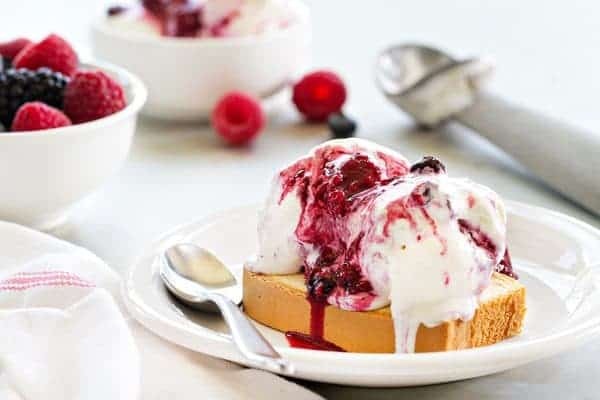 A few weeks ago I had the idea to combine two of my favorite things into one incredible frozen dessert and the result was this gorgeous gorgeous No-Churn Roasted Berry Ice Cream recipe. I whipped up the no-churn base and stirred in Nielsen-Massey’s Madagascar Bourbon Pure Vanilla Bean Paste which imparted delicious, real vanilla flavor and beautiful flecks of vanilla throughout the ice cream. I totally could have stopped here, but as we all know, I like to take things over the top – in the best ways possible. 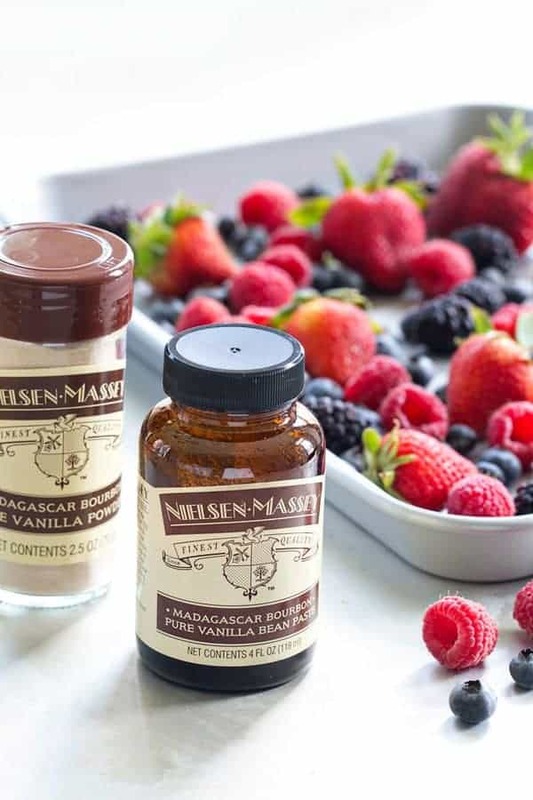 I used my friend Emily’s delicious recipe for roasted berry sauce that I flavored with a bit of ground cardamom and Nielsen-Massey’s Madagascar Bourbon Pure Vanilla Powder. This recipe makes quite a bit of berry sauce, so you’ll have plenty of leftovers for Berries and Cream Milkshakes, Roasted Berry Napoleons, or Chocolate Berry S’mores. Clearly, I have a serious thing for roasted berries! 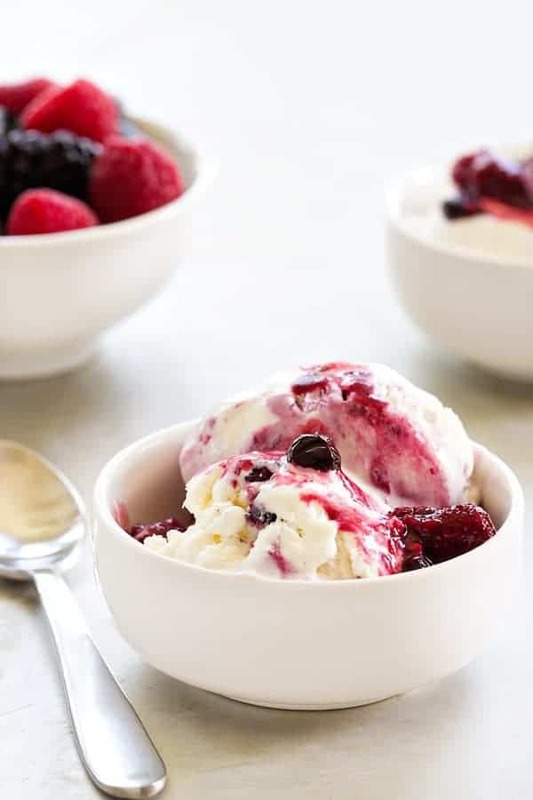 I gently mashed the cooled berries with a fork and swirled them into the ice cream to create lovely ribbons of berry goodness. If you’ve never experienced the combination of pure vanilla and fresh berries, my friends, you must. This is a flavor combination that is simply incredible. Especially when you make sure to use quality vanilla, like you can get from Nielsen-Massey. I’ve been using their products for years, and they’ve never let me down. You’ll be making this no-churn ice cream for years to come, I can promise you that. Yummy in my tummy, looks delish!!! Hi. Thanks for the recipe. Wanted to ask how much of berry sauce do you end up with from that recipe? Hi, Nirvana! It’s going to give you about 2.5 quarts. I hope you enjoy it!